A lot of small businesses, and individuals, have Analytics software installed on their websites, but never use it. So I thought it was about time to shed some light on how this powerful tool can be utilised to help make the most out of your website. And to start with, let’s have a look at Bounce Rates. 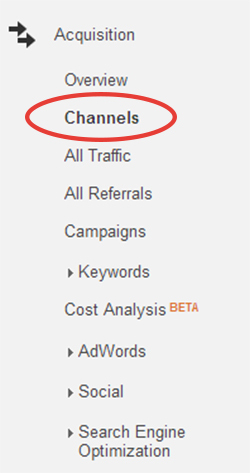 For this guide, let’s assume that you have Google Analytics installed and configured. You may have logged on to have a look and been a trifle overwhelmed by the sheer amount of data available, so just had a quick look at the traffic graph to see how many people have been visiting your site, and maybe where they’ve come from. But there is so much more to Analytics than just the number of visits, and one of the most revealing and useful is Bounce Rate. Different analytics packages use different rules to determine what counts as a “bounced visit”, but Google Analytics bases it on a visit where the user doesn’t move past the page they entered on. The bounce rate is then calculated as a percentage of total visits that bounced. So if you have a total of 200 visits, and 20 of them bounce, that’s a 10% bounce rate (or BR). Bounce Rate is great indicator of engagement on your website. As a general rule; a high bounce rate suggests that users arriving at your website, didn’t immediately see what they were looking for, and so left. But a low one, implies that the content you are offering your visitors appeals to them, and they want more, and are prepared to click for it. Unfortunately though, in the real world it isn’t as cut and dry as all that. Perhaps your website contains all your information on the first page, in which case your users will have little need to navigate further into the depths of your site. In this instance, a different metric, such as Time On Page, would be required to determine user engagement. This doesn’t mean, however, that you should add a step to force your users to click somewhere to get information they need, i.e. only providing a small snippet. you will find that we Internet Users are an impatient and fickle lot, and will just click Back sooner than navigate deeper. So you see it’s all relative to the website you have. For our purposes, however, we’re going to imagine that your website is pretty standard, and offers a wealth of content deeper than the homepage. So for this, a bounce rate lower than 30% is considered fairly normal. But just because you have that, doesn’t mean you should rest on your laurels and pat yourself on the back. It can always be improved upon. So how do you go about improving this? A good first place to start is to have a look at which channels are creating the highest bounce rate. This can be found in the Acquisition side menu of GA. This shows the major methods by which your users have stumbled upon your website, including Organic, Paid, Social, Referrals, and Direct. This allows you to gauge some perspective on your users’ behaviour on your site. For example, say you find that PPC results in a high bounce rate of 80%, you now need to ask yourself why. Think about where you are sending your PPC visitors; is the Landing Page interesting? Does it provide the information they would be looking for? Is the navigation clear? Is there a strong Call to Action? If your referral Bounce Rate is high, have a look at where exactly they are coming from. Perhaps it’s from a link on a site that isn’t relevant to your business, so you might want to remove said link. Social bounce rates have a tendency to be on the higher end of the spectrum, purely because of the nature of the visit. When you click on a link on Facebook from a friend’s post, you are less likely to continue your useage on the new site than you are to return to Facebook. I.e. it’s harder to grab someones focus, when they are already focussed elsewhere. Once you’ve investigated the traffic sources, next it’s worth having a look at the specific pages that a resulting in a high bounce rate. To find this click on the Behaviour link on the side menu,then Site Content > Landing Pages. Click on the top of the Bounce Rate column to sort the results from high to low. This then gives you an idea of user engagement across specific pages on your website, and perhaps highlights those that need a bit of work to draw your users in. Lowering Bounce Rates is all about the User Experience. Put yourself in your visitors’ shoes, and think about what would make you click on through. It’s important to think about the step before arriving at your site; what were they doing that lead them to you? In the case of PPC, do your keywords fit with the content on the Landing Page and answer the question the user had when they searched? Basically, does your page provide what your users were looking for, if not then they are unlikely to stay. For referrals and social visits; is your page well designed with clear navigation to more of your great content? Is the content itself engaging, thought-provoking and interesting? If you can, use some A/B testing to see which version results in a lower bounce rate, then roll out those changes across all relevant pages. A/B testing is a fantastic way to trial things, before committing to any grand design or UX alterations. Make it easy for your users to use your website. This seems obvious, but so many websites are overly complicated, filled with useless content, difficult navigation and tricky designs. If it’s too hard to find what they are looking for, your users will exit. So use design wisely to direct the eye to where you want them to go. Use language to entice your visitors to find out more, and explore. Don’t use pop up menus, or overly flashy animations that serve no purpose. Don’t bombard them with impenetrable walls of heavy text. Keep it simple, elegant and engaging. If you only look at your analytics infrequently, spare a little time for Bounce Rates as they not only give a great indication of engagement, but they can help identify specific areas that require attention on your website. Think about why your visitors have arrived and where they have come from, and make sure your content answers their questions. Make your site easy to use, and simple to navigate, with strong CTAs that entice your user through your site without forcing them. Above all, remember that it’s about User Experience. So make sure that every change you make enhances the UX, and you should find your bounce rates start to fall. Next time I’ll be looking at Pageviews; what they mean, and how they tell you more than Visits. Edit:“Next time” has arrived! Read our article on Pageviews vs. Visits.